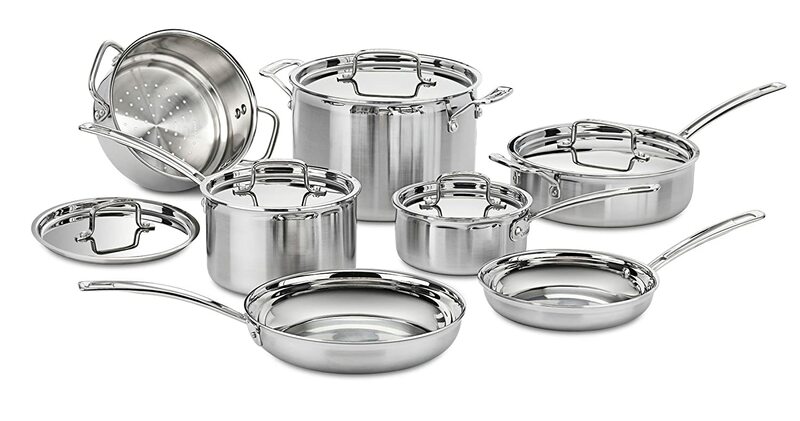 With an elegant and contemporary look, the Cuisinart MultiClad Pro Stainless Cookware set is an investment in cookware. Designed for years of cooking enjoyment, the MCP-12 pots and pans have some great features that will make cooking easier and more pleasurable. Featuring triple-ply construction, secure lids and drip-free rims, the MultiClad Stainless Steel cookware set rivals some of it’s much higher priced competition. With excellent consumer ratings, this set seems to be a favorite among home cooks everywhere. Read my in-depth review to find out what makes the Cuisinart MultiClad Pro Stainless Steel set one of the top picks for cookware sets. The Cuisinart MCP-12 MultiClad Pro Stainless Steel Cookware Set is designed with triple ply material. The cookware’s core is pure aluminum, and it is sandwiched between an interior layer of stainless steel and a brushed stainless steel exterior. Aluminum is used because it conducts heat better than stainless steel alone. The tri-ply construction provides superior heat conduction and even heat distribution. The interior of the pans is smooth, though not quite mirror-like as suggested by the company. The set is sturdy and heavy, and is what you would expect to find in a higher end cookware set. The cookware set is attractive, though perhaps not quite as much so as the All Clad line. A nice feature of the Cuisinart MultiClad Pro cookware set are the tapered rims that allow for drip free pouring. Many of the cookware sets we’ve looked at don’t have this feature, so it’s a nice plus. The pots and pans in this set have riveted, Cool Grip handles that do stay cool during cooking. Some comments I’ve read do suggest that the handles of the lids do not stay cool during use, and one should use pot holders when lifting or replacing them. Another nice feature of the Cuisinart MultiClad Pro set are the tight fitting, stainless steel lids. Having secure fitting lids helps to seal in foods natural juices and helps maintain nutrients. The result is food that is healthier and tastes better. In fact, the lids are so tight fitting, Cuisinart includes instructions for breaking the vacuum seal that is created between the lids and pans during cooking. The Cuisinart MCP-12 MultiClad Pro Stainless Steel Cookware Set is oven safe up to 500° F. This makes the set safe even for use under broilers. Extra care should be used when the pots or pans are used in the oven as, obviously, all surfaces including the handles will become hot. Cuisinart offers a lifetime limited warranty on Cuisinart MultiClad Pro Stainless Steel Cookware. It is warranted to be free of defects in material and workmanship under normal home use from the date of original purchase throughout the original purchaser’s lifetime. Of course, the warranty does not include any damage caused by misuse of the cookware or accidental damage. It also does not cover scratches, stains or discoloration. Please see the owner’s manual for additional details. As mentioned previously, this is a nice, heavy set that has a sturdy feel to it. 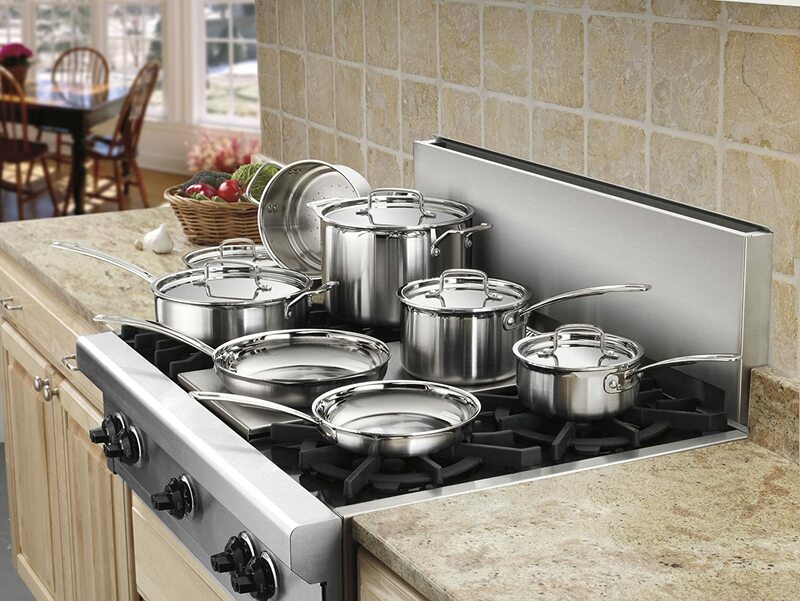 With proper care, the Cuisinart MultiClad Pro Stainless Steel Cookware Set is designed to last for years. The MultiClad Pro cookware may be washed in soap water using a sponge or soft cloth. Steel wool or metal pads should be avoided to prevent scratching the pots and pands. The cookware may also be washed in the dishwasher. Cuisinart does recommend using a non-lemon detergent. While dishwasher use is safe, it’s really not recommended over the long term, as regular washings in a dishwasher will inevitably cause scratching on any utensil, including stainless steel cookware. At Amazon.com, consumers have overwhelmingly rated the Cuisinart MultiClad Pro Cookware Set as 4 stars or better (on a scale of five). There are many positive comments and observations to be found, and very few negative remarks or issues. One reviewer went so far as to say that, for the money, the Cuisinart set is even better than All-Clad. Other reviewers also commented on cookware sets they had tried previously – and discarded – after using the MCP-12 pots and pans. A couple of the other brands mentioned were Circulon, Chefmate and Farberware. Most consumers loved the cookware set and felt that the quality was great, given the affordable price tag. The set is well built and attractive, and the pieces feel sturdy. One reviewer mentioned that the lids are all interchangeable and they all fit well. Another reviewer pointed out that the rolled, drip free edges that make pouring so easy are one feature that the popular All-Clad line doesn’t offer. Reviewers were happy with how the pans heated up and cooked food. Many people commented that the pieces heat up quickly, and food cooks evenly. Several people were happy that the newer versions of MultiClad pots and pans are safe for induction cooktops. Users stated the Cuisinart MultiClad Pro cookware is easy to clean and is dishwasher safe. The set also seems to wear well. In fact, one customer updated her review to say that after 10 years of use, her Cuisinart MCP-12 set still looked new. Of the negative comments, one of the most prevalent seemed to center around food sticking to the pans. If you’re making the switch from non-stick pans to stainless steel, it may initially seem that stainless steel is harder to clean and that many foods stick to it. There are some simple tricks you can use to prevent this from happening. See my tips in the “Pros & Cons” section. 1.) The set is heavy and well built. It feels sturdy and is attractive. 5.) Can be used on any cook top including induction ranges. 3.) If you’re used to using non-stick cookware, making the switch to stainless steel may take a little getting used to. Because the triple-ply construction conducts heat so well, allowing for quick heating and even heat distribution, it’s possible to use lower temperatures when cooking with this set. Using a lower temperature will make food less likely to stick. Cuisinart recommends never using heat higher than a medium-high setting, even when boiling water. Preheat the cookware before use and add a little fat or oil to pan. Consider using a non-stick spray like Pam for eggs or any foods that tend to stick.